FILE - A car driving along the bandit-plagued road between Sebha and Ubari in southwestern Libya, Dec. 24, 2013. A new report, the most extensive on illicit weapon flows in the Sahel in several years, confirms arms looted from huge Libyan stockpiles after the ouster of Colonel Moammar Gadhafi have fueled Islamist insurgencies in North and West Africa since 2012. But jihadists and Tuareg fighters have diversified their supply chains and have added new sources as the outflow from Libya has decreased, due partly to interdiction efforts and a rising internal demand in Libya for weapons as the conflict there looks set to escalate. Jihadists and other Islamist insurgents have plundered arms from inadequately secured national stockpiles in Mali, the Central African Republic, and Ivory Coast, according to a report by Conflict Armament Research, a London-based independent organization that tracks illicit weapon movements. And jihadists in the Sahel are also using assault rifles that have their origin in Syria and Iraq, thanks to a supply chain from the Islamic State terror group, which likely seized the weapons from Syrian and Iraqi government forces as its militants advanced in 2014 and the early part of last year. CAR’s report is alarming European counter-terrorism officials as much as their counterparts in the Sahel and West Africa. The study was funded by several EU governments, which fear weapons, including shoulder-launched surface-to-air missiles, could be smuggled into Europe along migrant routes and used for terror attacks in European capitals. In June, the U.N. Security Council authorized the interdiction of ships on international waters suspected of smuggling weapons into and out of Libya, hoping that would make it harder for jihadists and other insurgents to secure arms and to reduce the firepower of Islamists in the Sahel. The United States and its European allies have been trying to stem the unregulated trade in Libyan arms, which have flooded the region since Gadhafi’s fall, an effort aimed at assisting hard-pressed governments in the Sahel as well as to reduce the chances of weapons being smuggled into Europe. The report says various factions have access to a terrifying range of weapons including shoulder-launched guided missiles, anti-tank landmines and rocket propelled grenades. The picture painted by CAR provides a glimpse of more complicated arms flows that have shifted and evolved during the past two years. 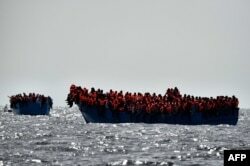 While high-seas interdiction by the European maritime force SOPHIA, whose main mission is to pursue smugglers ferrying refugees and migrants, may help to disrupt arms-smuggling into Europe, officials acknowledge it has no impact on weapon flows across the Sahel. “Arms trafficking is highly organized and jihadists already have large stockpiles,” says a French counter-terrorism official told VOA. “We are going to start seeing those arms in Europe,” he fears. FILE - Migrants wait to be rescued as they drift in the Mediterranean Sea some 20 nautical miles north off the coast of Libya, Oct. 3, 2016. 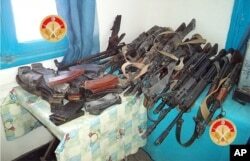 Since 2011, research and media narratives about illicit weapon proliferation in the western Sahel have focused primarily on weapons originating in Libyan stockpiles or trafficked by Libyan armed groups,” notes CAR’s report. Such flows remain significant, but “they are diminishing and, in some cases, being reversed,” the researchers add. “While these changes are partly due to border security enforcement and convoy interdiction by national and international forces, they also reflect rising internal Libyan demand, particularly in the southern areas of the country,” according to the study Investigating Cross-Border Weapon Transfers in the Sahel. Armed violence in the Sahel region is being fueled now by weapon and ammunition flows originating outside Libya. CAR found evidence of Sudanese small arms ammunition in circulation in southern Libya and Mali; recently manufactured Russian and Chinese ammunition in circulation in southern Libya; newer Chinese Type 56-1 assault rifles similar in type and year of production to rifles captured by Kurdish forces from IS militants in Kobane, Syria; and Iraqi-manufactured and imported assault rifles. FILE - An image made available by propaganda Islamist media outlet Welayat Halab allegedly shows the trademark Jihadist flag positioned in the Mishtenur area, a plateau south of Kobane, Syria. One of the most surprising discoveries of the study is the large number of arms originating from Côte d’Ivoire. “The prevalence of Ivorian-origin small arms across the region is a particularly unexpected finding of this investigation,” the researchers say. Weapons plundered by Islamist militants and separatists from substantial stockpiles of the Malian security forces since 2012 are also being trafficked across the region.